Summer is almost here. Time to have a lovely summer party outdoors, in your backyard, in the park or anywhere else with plenty of sunshine and fresh air. I have been pinning a few party invitations to inspire me and loved the idea of ice-cream invites. What better symbolizes hot summer days than ice-creams/popsicles? So, here I am. 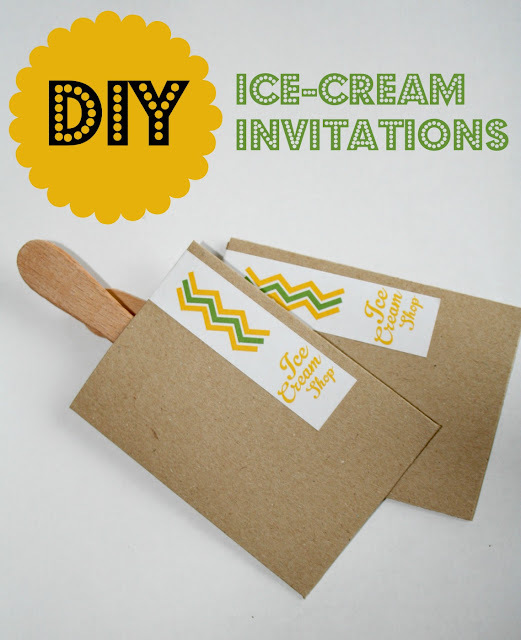 My version of ice-cream invitations for a picnic in a park. As often, my invitations are bilingual (two-sided), but you can easily omit the second language. - card (for invites) - I used thin plain matt white card (170gsm) as I was doubling it. 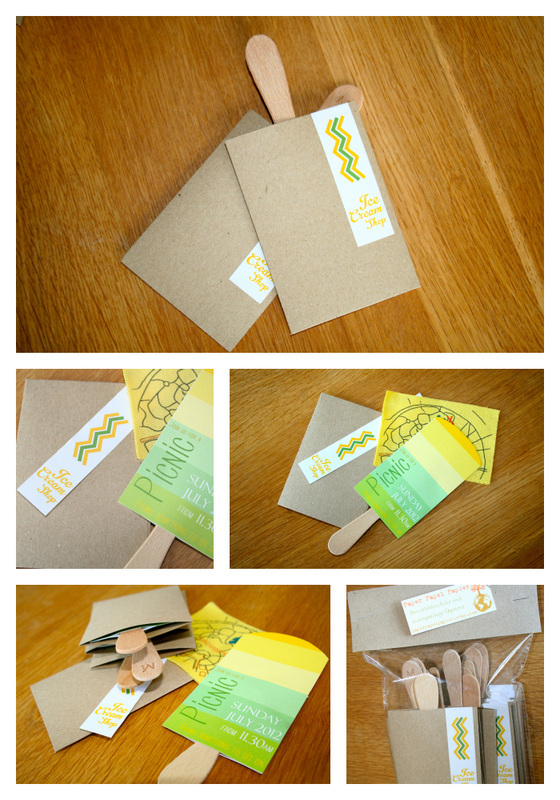 My picnic/ice-cream invitations contain 4 elements: envelopes (or pocket), map, ice-cream and sticky label. 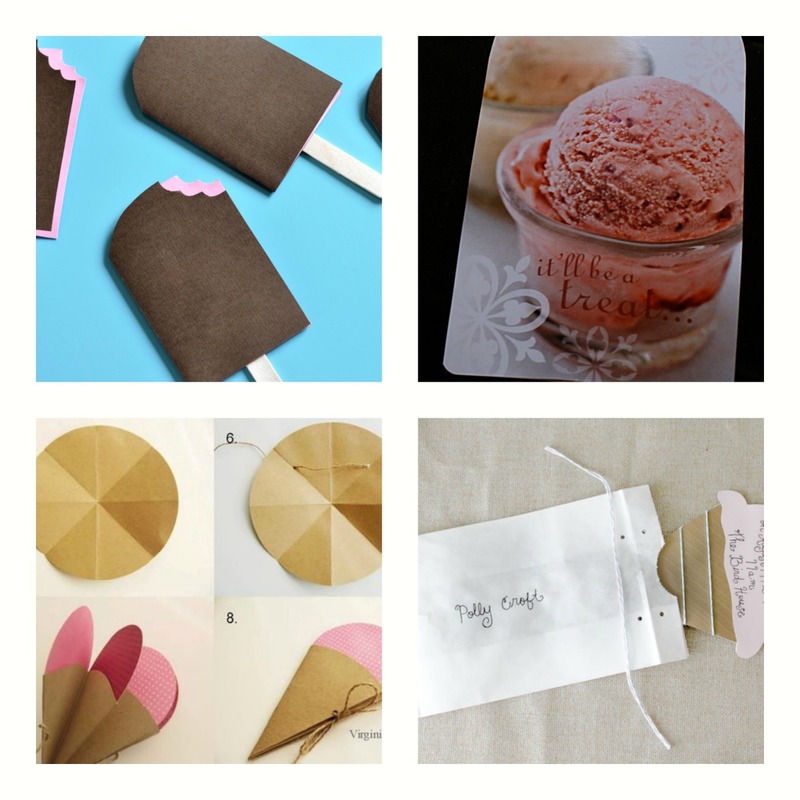 I made my own template, so the ice-creams are about the size of a business card (slightly bigger). I wanted sunshine and colour. I printed, cut out the cards and glued them on the sticks. I let them dry and then cut out a rounded shape for the top. My invitations are bilingual. But you could leave the other side blank or add more information (location, etc). 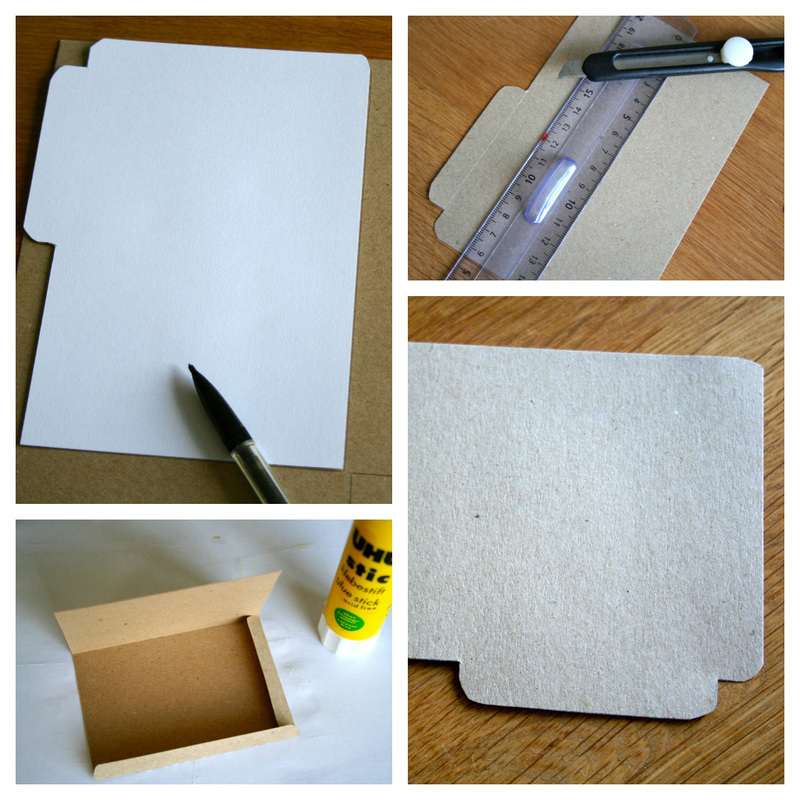 For the envelopes/pockets, I used a ready-made template I found on the web. I printed the template onto a thick piece of card and cut it out. I removed the top flap and increased the height slightly instead to make sure the whole ice-cream would fit in. I used kraft paper for my pockets as it is my favourite material and I wanted a little bit of recycled/green element. I simply marked the folds with the back of a craft knife, folded and glued with a simple glue stick. I let them dry under a heavy book to make sure they were glued properly. I wanted to make sure my invitations would not fall out of the pockets as these were not fully closed. So I made these simple labels (inspired by wrap-around labels for envelopes): a little bit of vintage-inspired text in the front and addresses and names at the back. These were then printed on self-adhesive white paper. I got stuck on this one for a long time…. I needed a little map or indications of where the picnic would be. Being a picnic, in a park, there is no formal address and it is a pretty big park. So I had to have a map. But I couldn't find an idea to go along with my theme. 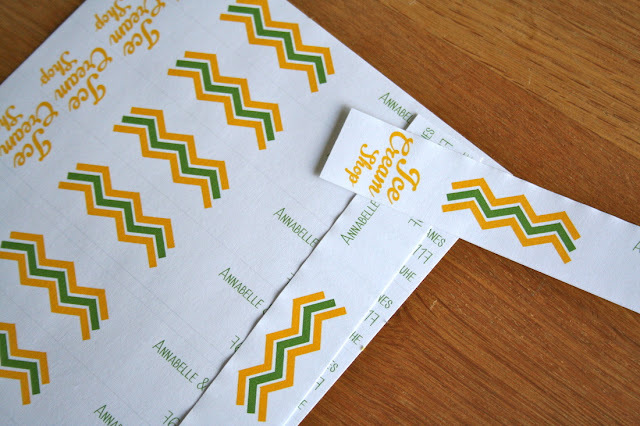 Finally, I saw a pin on Pinterest (again) about printing on fabric while I was searching for picnic blanket patterns or gingham patterns. And the idea was born. 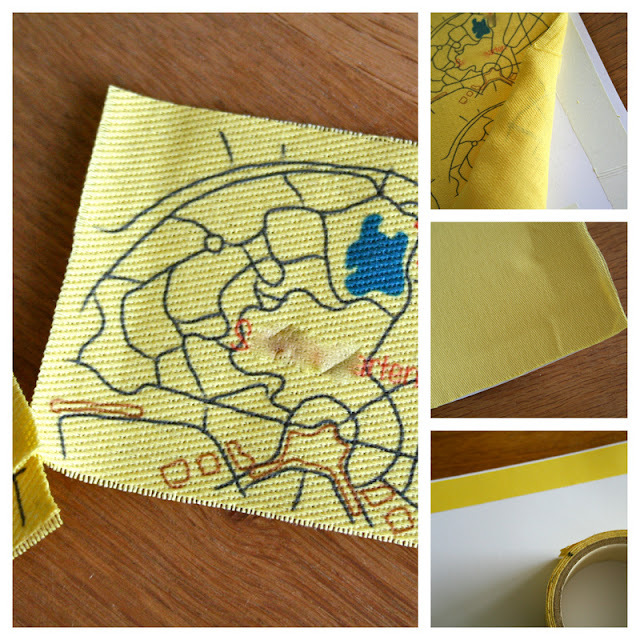 I could print my little map on fabric to give a little nod to the fact that we would be having a picnic (and that I was asking people to bring a blanket). So I followed these instructions and it worked a treat. I was amazed at how clean and well printed it was. I then cut out my little maps leaving the edges rough (like for a treasure map). I reused the card twice to print more but I had to reapply another layer of double-sided tape as it was much less sticky second-time round and the fabric got pulled out of the card by the printer. 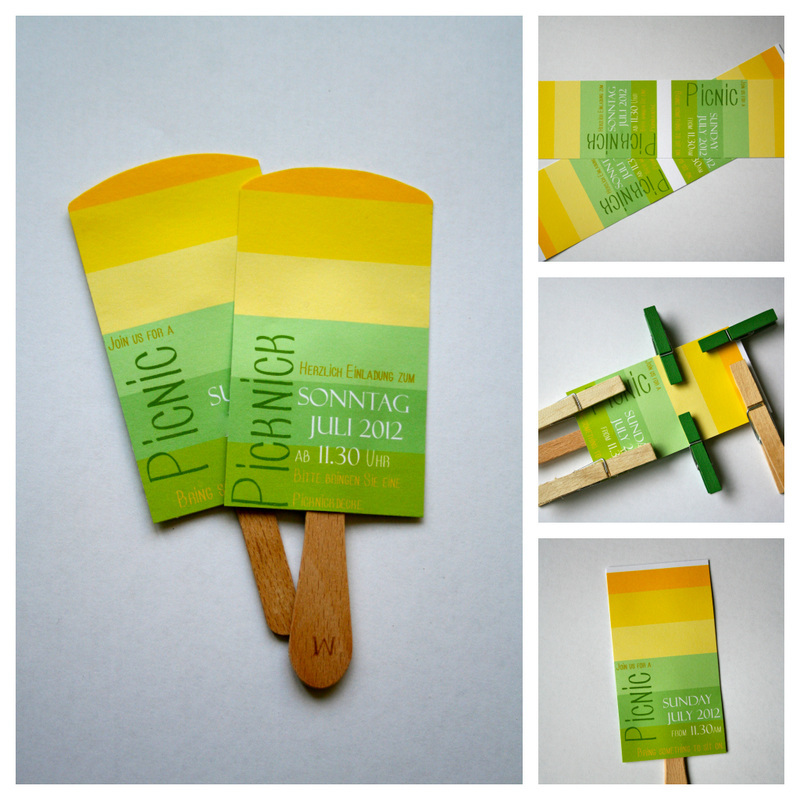 And here is the final result: DIY popsicles invitations. If you do not feel like making them yourself, contact me. I love custom requests.